The cost of hosting the Olympics has already risen dramatically. Olympics Minister Tessa Jowell has told MPs that the planning is "on track" in a Commons written statement. But her assessment faces close examination in the Commons at her departmental question session from 1520 GMT. The statement said that a "thorough assessment of all potential risks" has backed the £9.325bn budget for the games she outlined in March. It added that "months of careful scrutiny have confirmed" the budget - four times the original estimate - would be enough. Watch the debate LIVE on BBC Parliament. The statement came as the BBC learned a report to ministers said there was a 20% chance the budget would rise again. In November, the House of Commons public accounts committee attacked ministers over planning for the event, saying foreseeable costs had been "grossly underestimated". Ms Jowell, who has faced widespread criticism over the escalating cost of the games, has now set out the most detailed breakdown of expected costs so far. 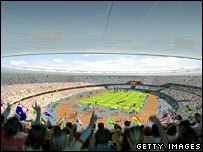 It shows that £500m of the contingency budget has already been allocated to the Olympic Development Agency. Ms Jowell also said a "detailed account of progress across the Olympic programme" would be provided when the first Olympic annual report was produced in the New Year. She said the delivery authority would also issue "a summary of the baseline scope, aligned budget, programme and risks". These figures "will provide a robust baseline for future reporting", she said. Ms Jowell told MPs: "This statement shows... the budget is consistent with the funding package I outlined in March. "Months of careful scrutiny have confirmed that the Olympic Delivery Authority has the money it needs to deliver the venues and infrastructure for a terrific summer of sport, as well as leaving a long-term legacy for one of the most deprived parts of the country. "Now we look ahead to what will be a dramatic 2008, with the first building work starting on the Olympic Park site, the Beijing Games and the start of the four year countdown to London 2012." For the Conservatives, shadow Olympics minister Hugh Robertson said the statement provided a "welcome initial baseline but falls far short of the full and open budget we had been seeking". He added: "The obvious omission is any mention of the mass participation sports legacy which was the key commitment in the London 2012 bid but, as yet, remains uncosted and unfulfilled. "Monthly cash-flows and a breakdown of the contingency are also needed if we are to ensure the budget doesn't increase further." Liberal Democrat Olympics spokesman Tom Brake said it was a "relief" the budget had not breached the benchmark of £9.3bn. "This has to mark the end of handouts from lottery good causes being used to pay for cost overruns. "From now on, both the Olympic Delivery Authority and their contractors will have to cut their cloth to keep within this budget."